There’s a lot to love about summer: School's out, everyone’s wearing flip-flops, the trees are a brilliant green and you tend to grill out more nights of the week than not. For families across the nation, one of the best parts of summer is taking off on a vacation. It’s rare that everyone can sit down and eat every meal of the day together, see new things, discover unexpected adventures or explore a different way of life, but on a great family vacation, these things happen several times a day. The hardest part of any vacation can be deciding where to go. You want to find a place kids and adults will love, and have an experience that will create lasting memories for years to come. 1. Seek out unique experiences. The beautiful thing about traveling with kids is being able to celebrate their “firsts.” That magical excitement they have when they first feel the beach between their toes or see the ocean for the first time will warm your heart. This is why so many families head to a seaside getaway. In Myrtle Beach, South Carolina, you'll find these and many other opportunities for “firsts,” such as kayaking along scenic rivers to see wildlife, spotting a dolphin and for the brave, zip lining. Your kids' excitement will be contagious. 2. Act like a kid with your kids. Though you have adult responsibilities, that doesn’t mean you can't act like a kid now and then. Build time into your itinerary for you to jump into the ocean, build sandcastles, float down your hotel's lazy river or eat ice cream like it’s going out of style. Being an adult is great, but acting like a kid is better. 3. Let everyone pick a fun thing to do. You don’t have to do all the planning on your own. In fact you shouldn’t. Let the kids help to plan activities for your vacation. For instance, when visiting Myrtle Beach many parents present a list of kid-friendly activities to their little ones — such as the SkyWheel and Ripley's Aquarium — and let them decide which one to visit. Allowing your kids to participate in the planning process like this helps to give them a sense of accomplishment, and feel like they made this vacation happen. 4. Stay where the fun is. When trying to decide where to stay, narrow your options down by considering how close you are to dining, attractions and other activities in the area. There’s nothing like being able to step outside of your hotel room and take a walk on the beach, collect sand dollars or build a sandcastle. Of course, lodging with an indoor water park will get an A+ from your kids. 5. Plan enough, but don’t overdo it. While an itinerary is great and can keep everyone on schedule, make sure to include time for relaxation or spur-of-the-moment activities. Be flexible. Sunsets, sandcastles and 100 other perfect memories often happen at the spur of the moment. Many times, the best part of a vacation is the surprise you never planned. Sunshine, blue sky, an ocean, sandy beaches, plenty of adventures: A great summer vacation has all the things you need to make a lifetime of memories. Best of all, no matter how much you plan, you’re bound to find surprises that exceed your expectations. 1. Seek out unique experiences. 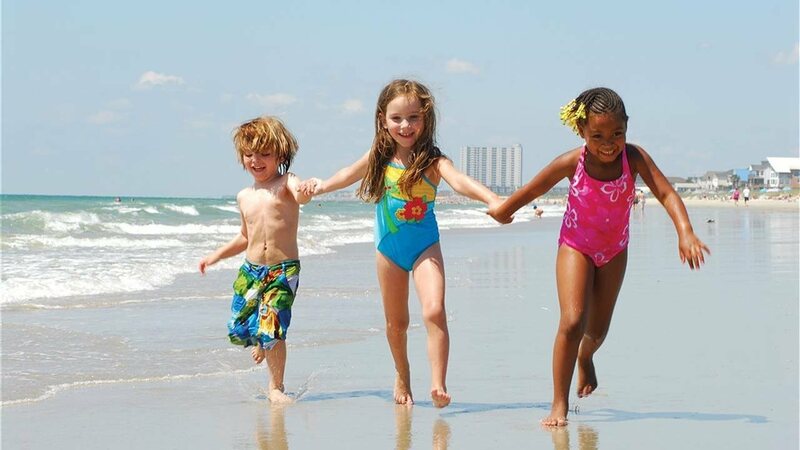 The beautiful thing about traveling with kids is celebrating their “firsts.” This is why so many families choose a seaside getaway like Myrtle Beach, South Carolina, where sunshine, blue sky, sandy beaches and plenty of adventures abound. 2. Act like a kid with your kids. Though you have adult responsibilities, that doesn’t mean you can't act like a kid now and then. Jump into the ocean, build sandcastles, float down your hotel's lazy river or eat ice cream like it’s going out of style. 3. Plan enough, but don’t overdo it. While an itinerary is great, stay flexible. Sunsets, sandcastles and 100 other perfect memories often happen at the spur of the moment.